Special Containment Procedures: Instances of SCP-2619 are to be kept in a standard, double-doored aviary at Site-23. SCP-2619 instances must be fed an insect diet consistent with that of members of the species Mimus polyglottos (northern mockingbird). Personnel are to be screened prior to working with SCP-2619 in the event of SCP-1028 preference. SCP-2619-1, unlike other instances of SCP-2619, appears to have the ability to transform into many different bird species, provided there is a human in its effective range. Outside of its range of effect, determined to be approximately 16 meters in diameter, SCP-2619-1 is a male Northern Mockingbird without any anomalous traits. When a human steps inside SCP-2619-1's affected range, SCP-2619-1 will convert itself into a different species of bird, usually one of personal preference to the human in SCP-2619's range. If the subject has ornithophobia or a general aversion to all avians, SCP-2619-1 will instead turn into the subject's least preferred species of bird and become hostile, engaging in territorial behaviors similar to those of mockingbirds, regardless of its present form. SCP-2619-1 was discovered in the city of ███ ██████, CA after a fight broke out amongst a group of birders over the identification of an individual bird. A distressed birder called police regarding a cassowary on top of a telephone pole, thus alerting Agent Danner, who had been undercover in the ███ ██████ Police Department to track possible instances of SCP-████. A small group of Lamda-4 MTF agents were called to the scene, where they successfully tracked and captured SCP-2619-1. The police initially dispatched to the scene and the group of birders were all given class B amnestics, and several distraught birders were sent to the hospital under the guise of treatment for acute sunstroke. Further investigation of the area revealed several birds with anomalous DNA. A black phoebe, Sayornis nigricans, a ruby-crowned kinglet, Regulus calendula, and several acorn woodpeckers, Melanerpes formicivorus, were found to have pure mockingbird DNA in 75% of all cells, suggesting the birds were a form of genetic chimera. All birds were designated as instances of SCP-2619 and taken into Foundation custody. Due to the unknown prevalence of SCP-2619 instances, several Lambda-4 agents have been tasked with continued investigation of suspected populations of SCP-2619 so that more can be obtained if detected. "NoMo3 EX5 Property of Operation Lazarus4"
No other instances of SCP-2619 were found with tracking tags, with the exception of SCP-2619-6, an acorn woodpecker. Investigation revealed the woodpecker's tag belonged to a nearby research station, though interrogation suggested that the naturalists who had tagged SCP-2619-6 were unaware of its anomalous properties. 1. Studies suggest SCP-2619's anomalous traits may have evolved from an advanced form of nest parasitism, wherein offspring would appear as the same species as host parents, improving chances of survival and spread of true parent DNA. 2. A researcher working with SCP-2619 suggested that extracting DNA from SCP-2619-1 while it is morphed into a member of an endangered or extinct species could be used as a tool in conservation efforts, as well as revival of lost species, via cloning and artificial insemination. Research requests into this possible utility have been rejected. 3. 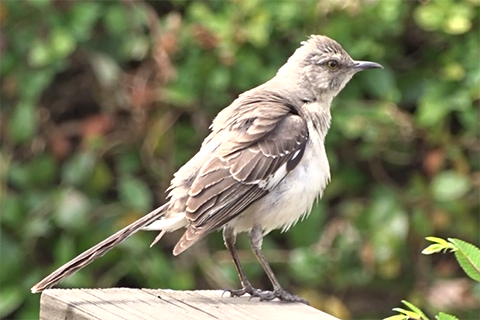 Ornithology alpha code for "Northern Mockingbird"
4. Considering SCP-2619-1's genetic properties, Lazarus may be a reference to the phenomena known as a 'Lazarus Taxon,' where a previously extinct species reappears with live members.